Rice is a staple food in our house because it’s filling, cheap and can be used in a variety of recipes. Confession: I don’t make rice on the stove. I actually hate the process. We use a rice cooker to make our rice because it cooks it perfect every time. No stirring, no mess, just great tasting rice. It makes rice cooking a lot less intimidating and easy; all we do is toss in a few ingredients, turn the rice cooker on and a little while later we have perfectly made rice. The rice cooker has especially come in handy with brown rice. I used to think I hated brown rice because every time I had it, it was hard, flavorless and boring. I thought brown rice was the worst but also mistakenly thought that it had to taste that way because it’s the ‘healthy’ choice rice. And we all know healthy foods taste bland right!? Of course now I see how wrong I was. I just had bad experiences with brown rice because whoever made it didn’t know what they were doing. They didn’t realize they had to cook it longer than white rice so that it gets soft, that it’s alright to add some seasoning to it or that it’s okay to cop out of the stove process and use a rice cooker. I am guilty of making the same mistakes when I first tried making brown rice. The first time I made it, I threw it out because I was so disappointed with the hard and grainy texture and lack of flavor. 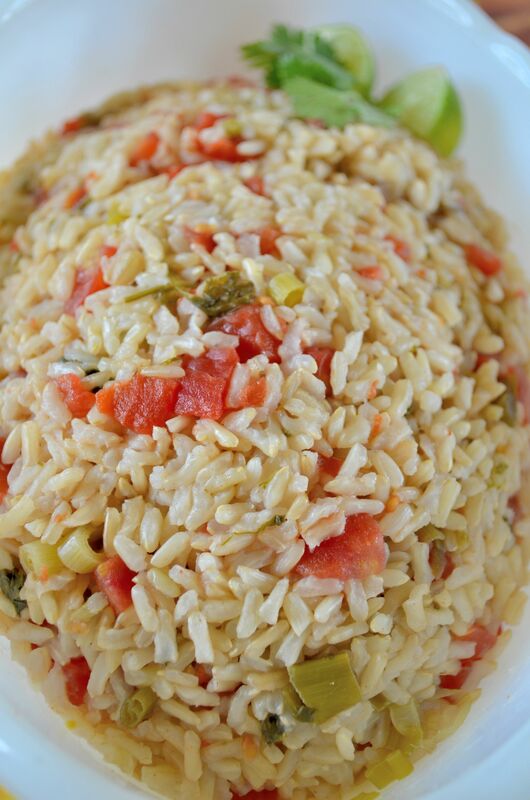 Brown rice makes you work a little harder for flavor but it can be delicious. Feisty brown rice is an example of that. 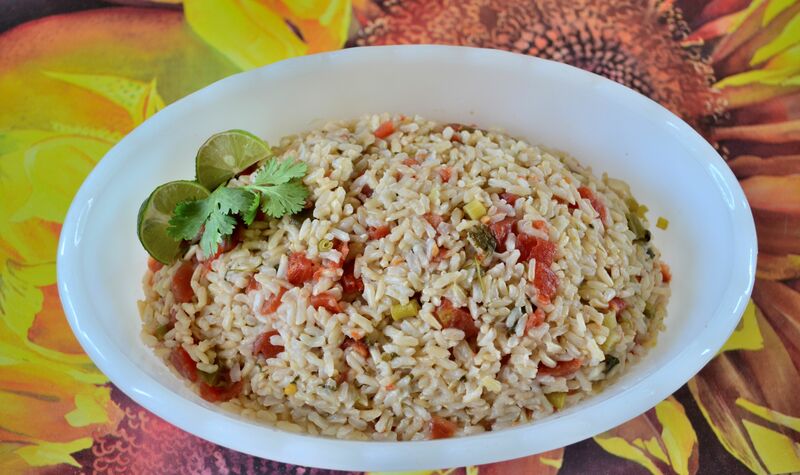 This rice is jammed packed with flavor, can be used as a side for taco dinner nights and thanks to the rice cooker, the rice comes out perfectly tender and ready to be devoured. So I cheat and I use a rice cooker for brown rice. I am unsure if I ever would have learned to enjoy brown rice if not for my rice cooker so I feel no shame. Long live the rice cooker! Add all of the above ingredients except for the can of mild tomatoes and green chilies into the rice cooker. Stir, taste and add more salt if needed. Set the rice cooker on the “brown rice” setting and let the magic happen. When finished cooking, mix in the can of mild diced tomatoes and green chilies and serve while warm.